This entry was posted on Tuesday, November 18th, 2008 at 8:13 pm	and is filed under Gentoo, OLPC. You can follow any responses to this entry through the RSS 2.0 feed. You can leave a response, or trackback from your own site. Hello. I’am so very happy, that there are so much people willing to help children in the lesser fortunate countries. Keep up the great work! I just want to point out that although the 2007 G1G1 was for North America, doesn’t mean that only US and Canadian citizen participated. I, for one, am Bulgarian and participated in the program through an American friend. I had to wait till the middle of February 2008 to actually receive the “get one” laptop. And I’m pretty sure I wasn’t the only European to give one and get one. Do you have to know who’s in charge for the haiti deployment? Yes, I do, but I probably shouldn’t leave their names here. You’re welcome to contact me in private and I can get you in touch with people. 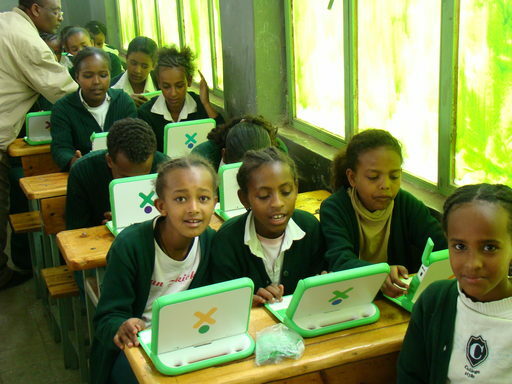 Great to see the OLPC project going on so well. As G1G1 is now finally available in Europe too, I bought 4 of them – 2 for my little brothers – 2 as a donation. Congratulations on your great pictures being chosen by Amazon/OLPC as the ‘official’ ones showing how the Laptops are used by the kids. I really liked your articles about the deployment. Please keep the world up-to-date about all this as good as possible – it’s a really nice project. Hey..this is a great job. I didn’t know yet that this OLPC has been running. This is great news that underdeveloped country’s children will get a chance to explore the world thru their laptop. Hats Off!